Parklake has many charming features to create an enjoyable and positive living environment. Its location offers tenants great options outside the building, one of them being easy access to various public transportation routes. Parklake apartment buildings are easily accessible to restaurants, shopping, and public transportation. Depending upon your destination (heading toward Brookline or Boston), you may take either the B or C Green line. If you are going west, the D Green line is within a short walking distance. If you have a car, permit parking is available. Additionally, Parklake’s location provides easy access to main routes such as Route 9, Mass Pike, or Route 128. For those who love to walk or jog, Parklake is a great place to take in your surroundings. A brisk walk around the Chestnut Hill Reservoir at sunset can be an entire experience in itself. Green Lines B, C, & D.
If you are headed to Boston via Commonwealth Avenue, the B Green Line is right outside the building. 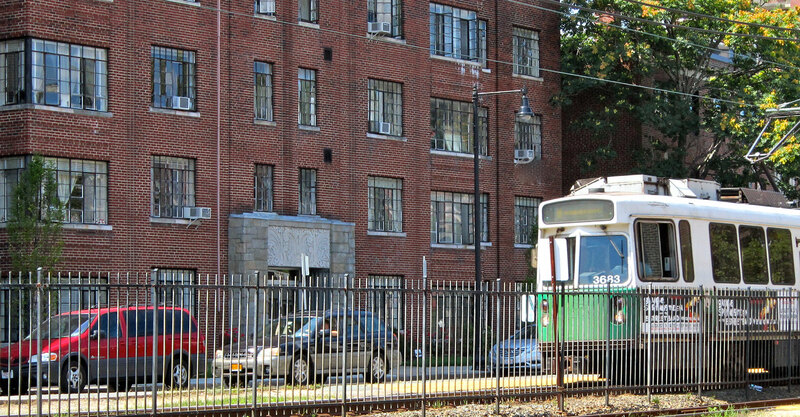 A five minute walk will bring you to the C Green Line, which will take you into Boston via Beacon Street, passing through Coolidge Corner in Brookline. A third option is the D Green Line at Reservoir Station. This line affords you more choices. You may head east toward Brookline, Fenway Park, and Boston. Or, you may go west, toward Newton to reach the Chestnut Hill shopping areas or Newton Wellesley Hospital.